Last year I shared a project that I had been wanting to revisit for a number of months. The LED lighting project for the awning was always a great success in the air awning, but in the rollaway, it just didn’t work. So I went back to the drawing board and shared how I made the new lights. I received a lot of great feedback from many subscribers and people who were now going to give it a go and make their own. So I thought I would revisit this project and give some answers to the many questions I have received. I did comment that I wasn’t entirely sure how I was going to fix the lights to the awning. I received many ideas and chose a suggestion of Velcro straps. I bought a roll of Velcro and glued 2 strips to each end. This will allow the lights to be easily installed, moved and taken down, so Thank you for the suggestions. Many questioned why I had these in parallel and not series. (i.e one after the other etc) This was why they worked so well in the air awning and not in the rollaway. In the air awning, they went from one end to the other. In the rollaway they will be fixed across, so all the power will be fed from one end. Each cable to each pole will be cut to length so it fits “just right” a truly bespoke installation. This is perhaps why it’s better to make your installation! I had some LEDs and some trunking left over from some recent projects. These two were combined to make a perfect addition to this project and I set about making a 12volt LED light that can be used with any lamp shade. (video link at the bottom) this light will suit us well for when we are in the awning sat at the table. You will notice from the diagram that there is a curious box titled remote. 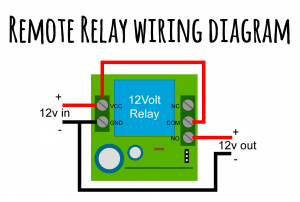 This box is a really simple and effective addition to the project. It’s a remote switch with a key fob that can allow the remote switch on and off of the lights. 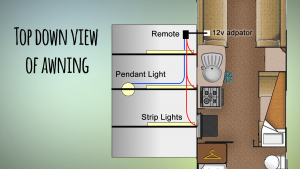 It is perfect for when we return to the caravan and need the lights on in the awning. These little devices are quite inexpensive. I bought mine for just £6 and they are readily available on eBay. Have a look at this listing. Wiring these is fairly straight forward all you need to do is bridge the 12 volts and away you go. Here is a really simple diagram of what I did to create the remote switch on. You will, of course, see of this when we go away in the caravan next time and I’m able to cut the cables install them correctly etc. It, I hope, will be worth it and will supply enough light for us to enjoy the awning in the evenings. Here is a video of the recent project updates. 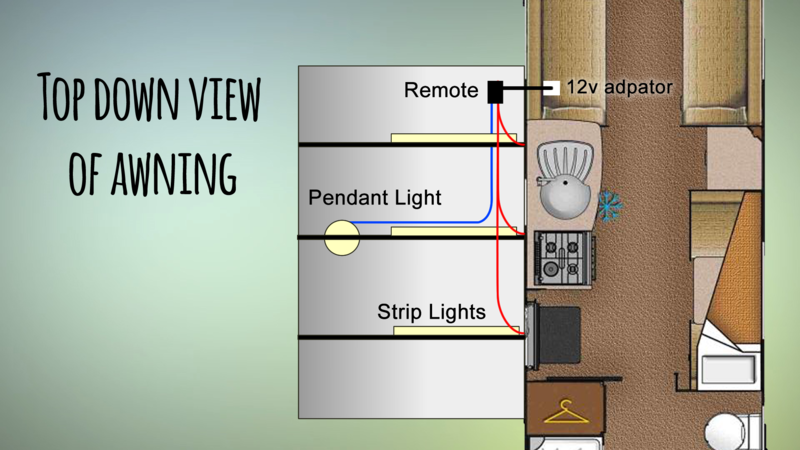 HI, you can add us on twitter as @TheTrudgians – for the lights, I’m going to adapt the current awning light on the caravan to incorporate a socket, so I can plug the lights into that. the charging idea is a great idea. we already have that facility in the wet locker, so will probably just extend that function. 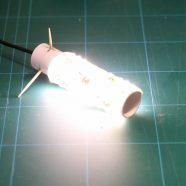 I’ve been enjoying your videos on the channel and have embarked on the LED light project including the remote control. I have made the lights and they work fine but i can’t quite work out the wiring for the remote. 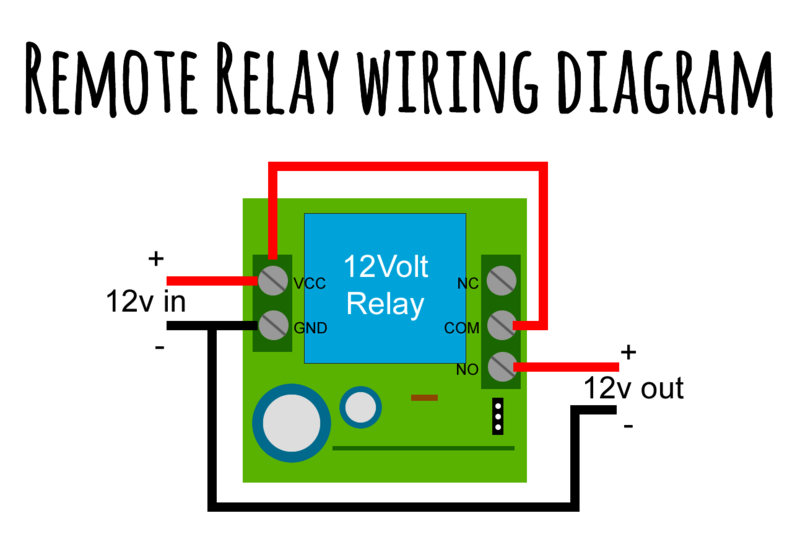 From your diagram are you adding in a piece of wire between 12+ IN to the COM port and then take the 12+ load from the NO connection? If so where does the neutral connect on the load side? Hope that make sense. I’m a bit of an electronics novice. Hi did you ever put the finished project on here?